David, the narrator of Simeon Marsalis's singular first novel, is a freshman at the University of Vermont who is struggling to define himself against the white backdrop of his school. He is also mourning the loss of his New York girlfriend, whose grandfather's alma mater he has chosen to attend. When David met Melody, he lied to her about who he was and where he lived, creating a more intriguing story than his own. This lie haunts and almost unhinges him as he attempts to find his true voice and identity. On campus in Vermont, David imagines encounters with a student from the past who might represent either Melody's grandfather or Jean Toomer, the author of the acclaimed Harlem Renaissance novel Cane (1923). He becomes obsessed with the varieties of American architecture "upon land that was stolen," and with the university's past and attitudes as recorded in its newspaper, The Cynic. And he is frustrated with the way the Internet and libraries are curated, making it difficult to find the information he needs to make connections between the university's history, African American history, and his own life. In New York, the previous year, Melody confides a shocking secret about her grandfather's student days at the University of Vermont. When she and her father collude with the intent to meet David's mother in Harlem--craving what they consider an authentic experience of the black world--their plan ends explosively. The title of this impressive and emotionally powerful novel is inspired by Paul Laurence Dunbar's poem "We Wear the Mask" (1896): "We wear the mask that grins and lies . . ."
Simeon Marsalis was born in 1990 and graduated from the University of Vermont in 2013. He has lived in New York, New Hampshire, and New Orleans. 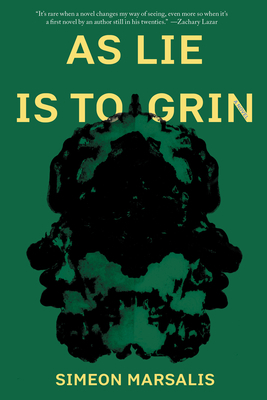 As Lie Is to Grin is his first book.